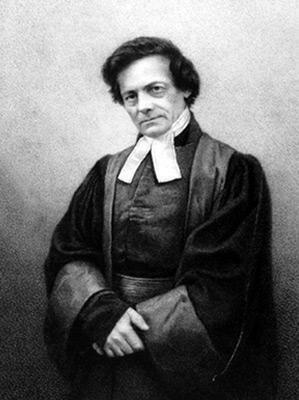 Pastor Adolphe Monod (1801-1856) © S.H.P.F. The fifth son of pastor Jean Monod, brother of pastor Frédéric Monod, he was educated in Geneva. During his first ministry to French expatriates in Naples he was “converted” to the ideas of the Revival Movement. In 1828 he was appointed to a parish in Lyons where he clashes with the liberal majority of the “elders” of the consistory whom he describes as non-Christian, « unbelieving and profane ». Encouraged by a Parisian group of “born-again” ladies, he let himself be carried away by his impetuous eloquence « where the most sombre expressions of despair and rapture would give way in quick succession to a tender and expressive smile » (“faisant succéder rapidement à la plus sombre expression de désespoir et d’extase un sourire tendre et expressif”). Having decided to give Holy Communion only to those members of the congregation he deemed worthy of it, he was accused of fanaticism and his dismissal asked for in 1832 on the grounds that « he failed in his duties » (“refus de service”). He then became the pastor of a “free” church(see The time of divisions). In 1836 Claramont Pelet de la Lozère, the Minister of Education and Religious Matters – himself a Protestant – appointed him as Professor of Ethics, Preaching, Hebrew, and, later, Exegesis. He ended his career as pastor of the Oratoire Protestant Church. Much sought after for his qualities as a great preacher (in the romantic style), he would preach wherever he was invited to do so. His lecture tours contributed to the progress of orthodoxy. He was one of the founders of the Evangelical Alliance. Later in life he evolved towards a more moderate position than his brother’s, Frédéric. At the Protestant Assemblies of 1848 he proclaimed his loyalty to the established Church and the principles of the Confession of Faith of La Rochelle.